A mid-weight short sleeve polo with contrast hem, cuffs, collar and placket. This piece features a dogtooth pattern, adding a mid-century feel to the aesthetic. Made from a high quality 100% cotton yarn with a soft handle. 12gg. 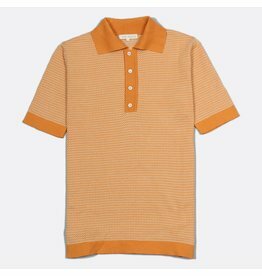 A light-medium weight polo-shirt, with short sleeves and three-button placket. This piece features a left chest pocket and vertical contrast stripes, adding a mid-century aesthetic. A short sleeved bowling shirt in a 'epik' print design. Shirt features an open collar, left breast pocket, reverse locker loop, straight hem, and genuine mother of pearl buttons. A long sleeved shirt in slub-linen fabric with floral repeat pattern. Shirt comes with a relaxed collar, single pocket to left breast, reverse locker loop, and curved hem. Finished off with genuine mother of pearl buttons. A long sleeved, classic plain shirt in a textured, slub-linen fabric. Shirt comes with a relaxed collar, a single pocket on the left breast, locker loop on reverse, and curved hem. Finished off with genuine mother of pearl buttons.